You’ve seen reproductions of Beni Ourains’ in current decor stores and in design magazines – but there is nothing like the real deal. 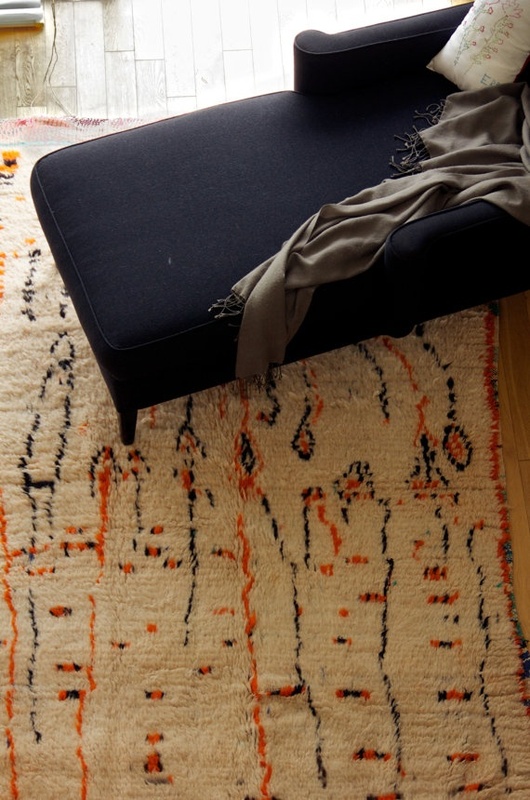 Hand woven in the Atlas Mountains of Morocco by the Beni Ourain tribe, with pile of off-white and black natural wool. 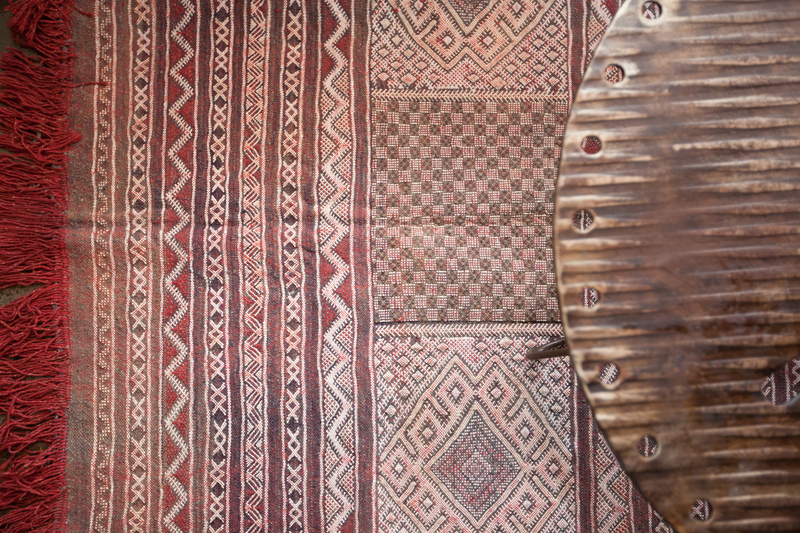 They are typically woven with simple harlequin patterns and tribal graphics. 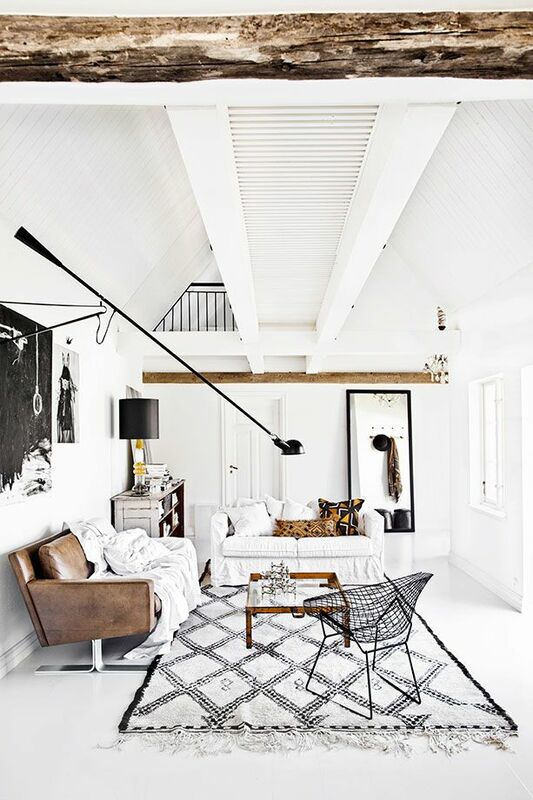 They style will in both Contemporary, Modern or Mid-Century style spaces. We are true believers they are a staple piece for every home! We just got a new collection of Beni Ourains in and thought we would share how to style with these one-of-a-kind beauties! A few weeks back, we did a photo shoot at a local event space, Salvage One. 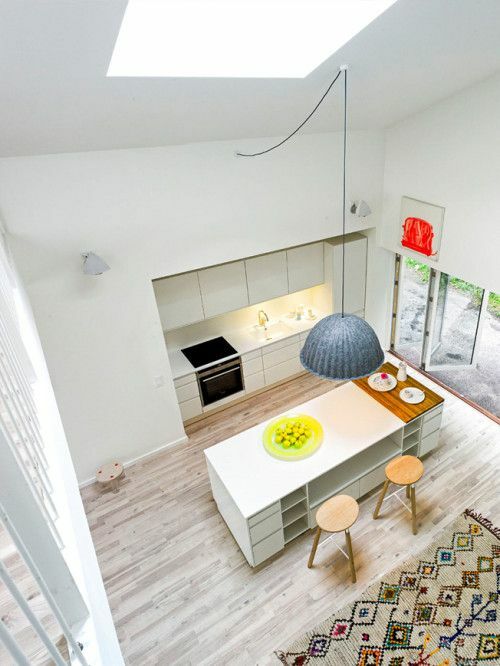 It is an old industrial loft (3 levels!) 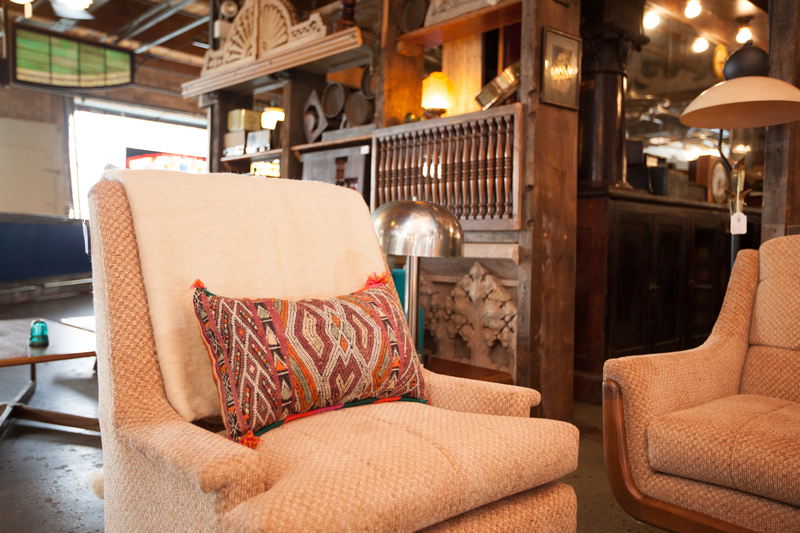 with vintage furniture scattered throughout. Oh my goodness, we were in heaven! 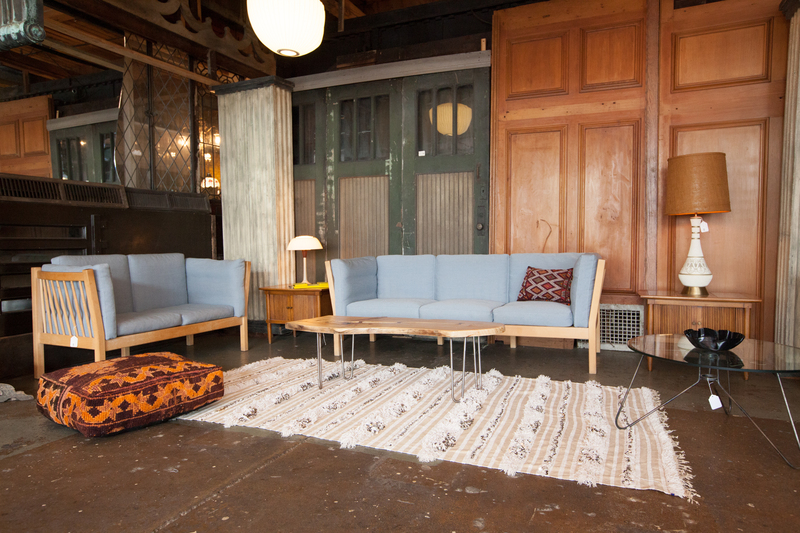 Had to share a few of our favorite shots of our products staged within. 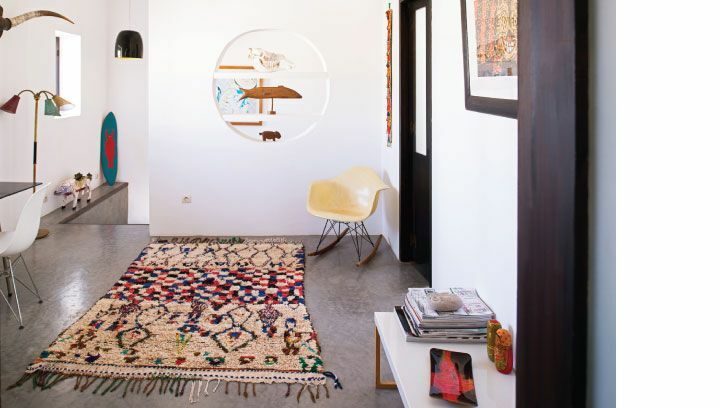 Featuring our Moroccan Kilim rug. 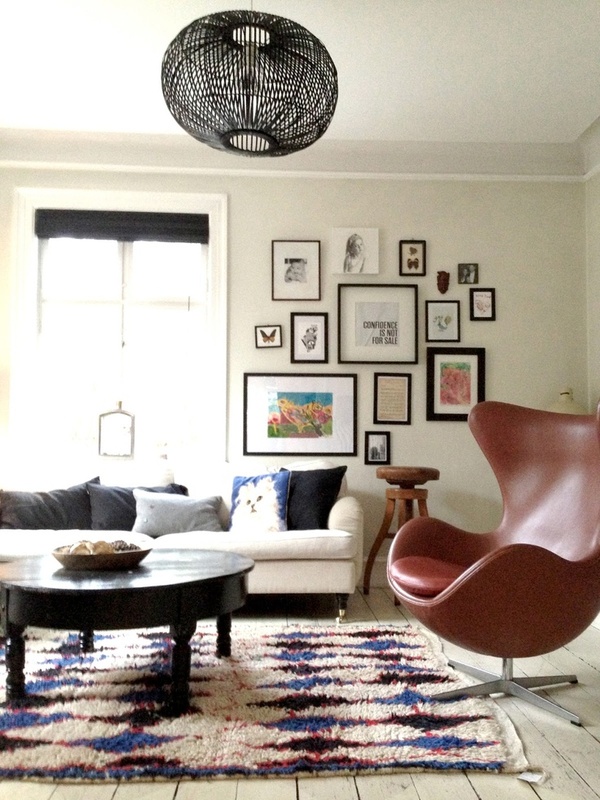 Looks beautiful with a mid-century leather couch. 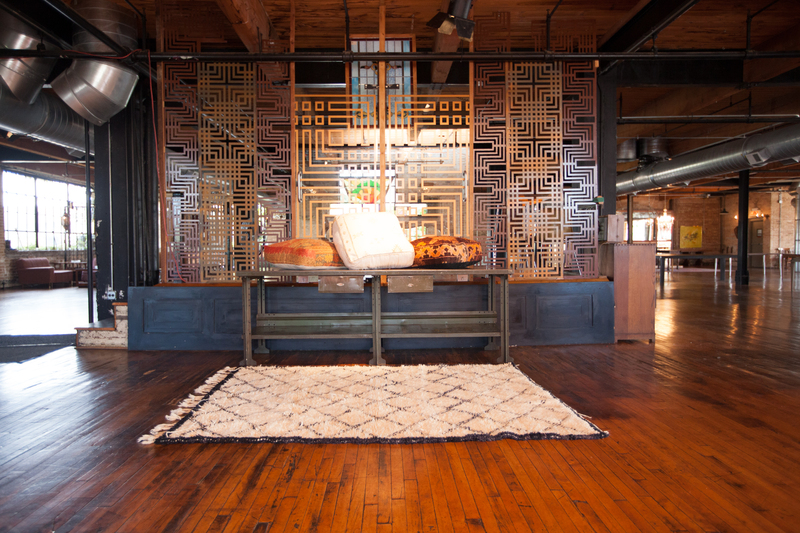 The details in the rug are simply stunning. Wedding blankets can make the most beautiful rugs. 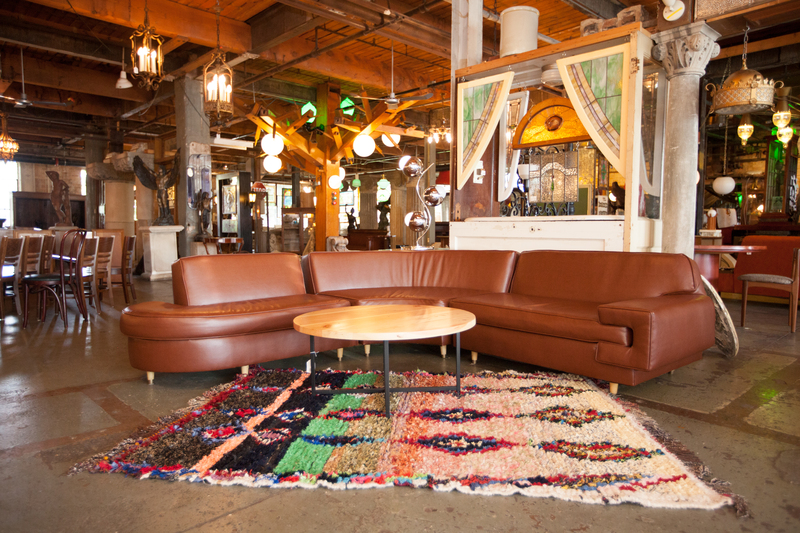 With simple furniture pieces like these, you can really spruce up a space with a colorful rug. 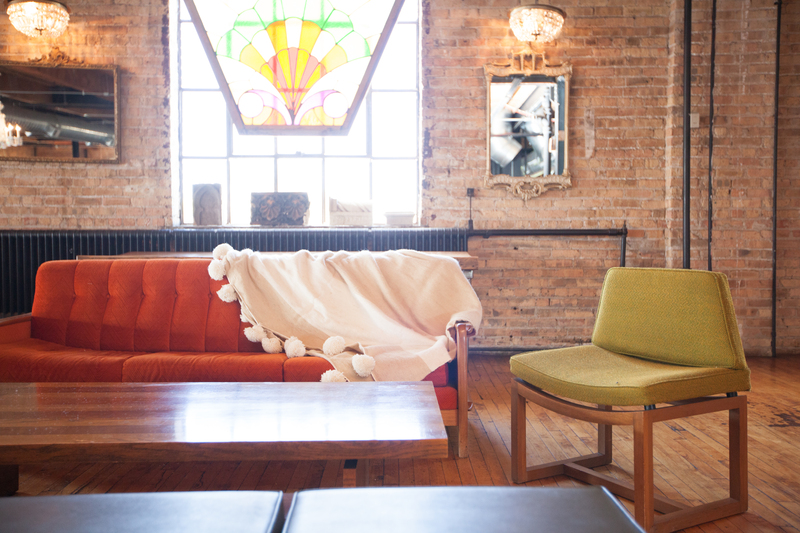 It helps add warmth and texture to the space. 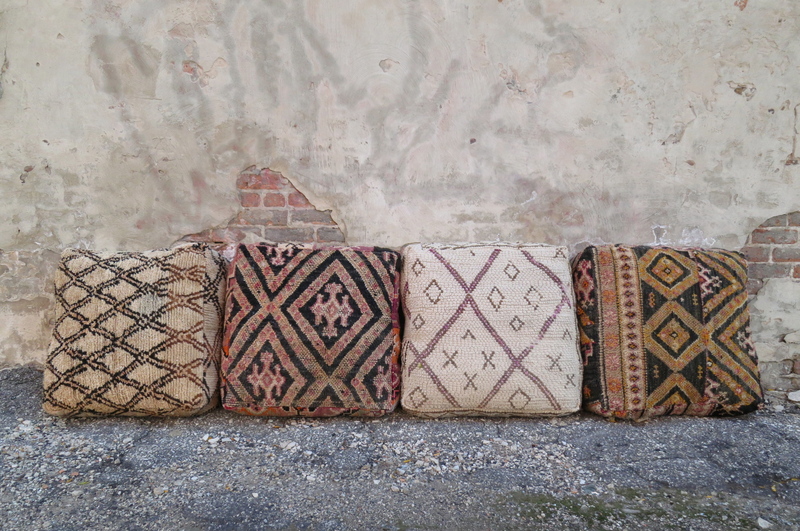 Kilim pillows… They are just perfection where ever you place them! 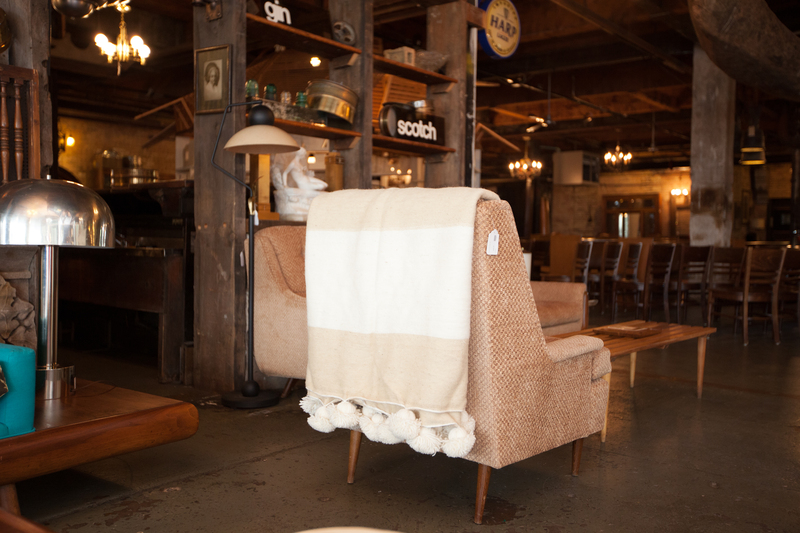 Try layering a chair (or couch) with a pom-pom blanket. These XL pom-poms help add a new dimension to a simple formed piece of furniture. Loving everything that is happening in the picture. 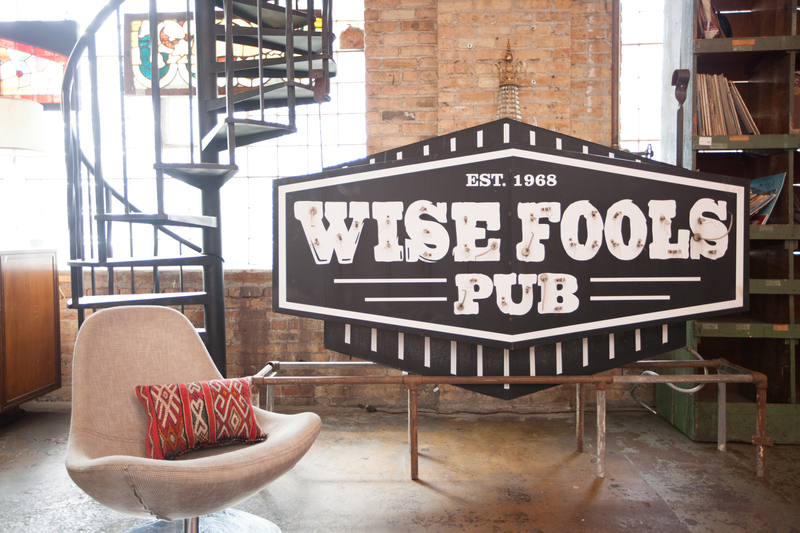 The vintage sign is incredible and so is the chair! 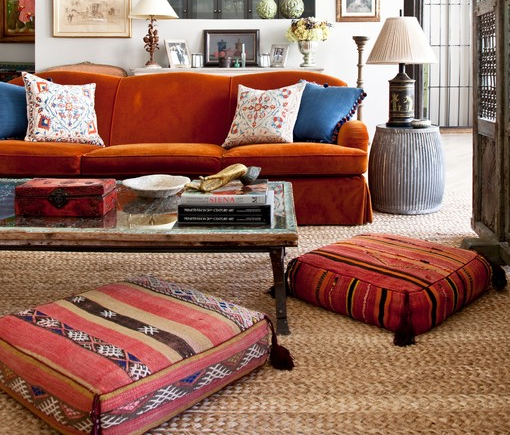 Our kilim pillow just adds a nice color pop. 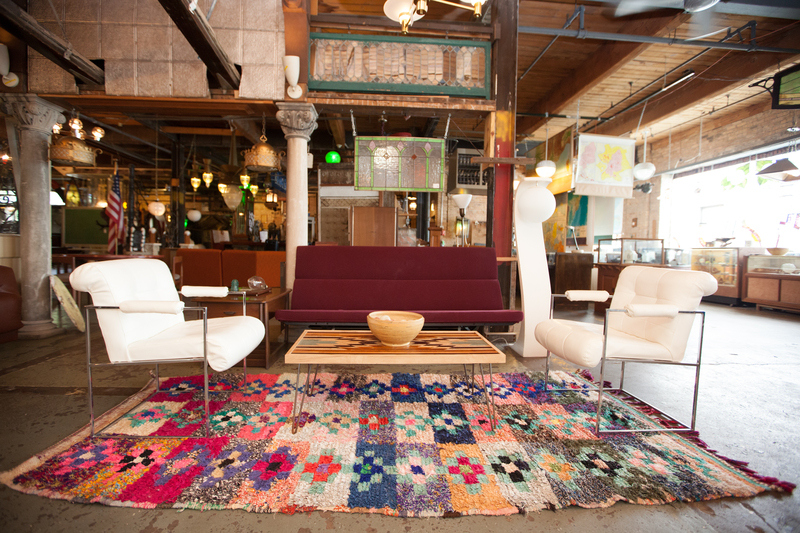 Truly, rag rugs can be used in any space. Obsessed with this look. 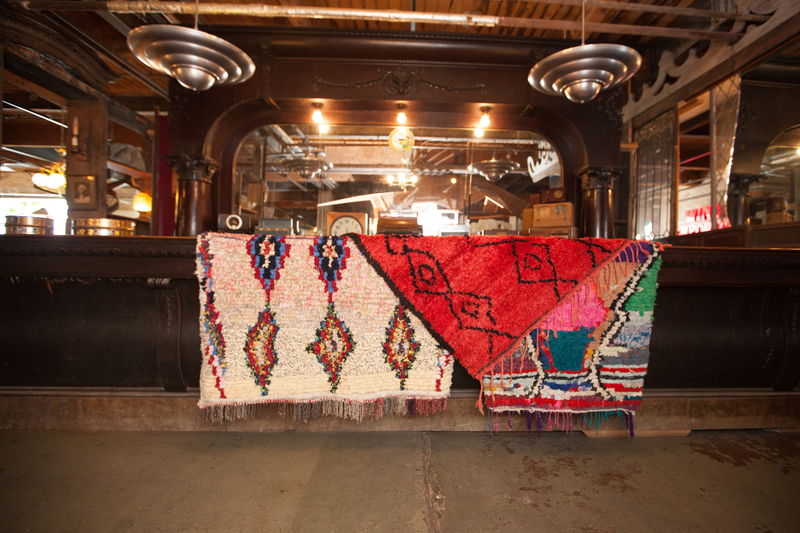 Boucherouite rag rugs layered on a bar. Gotta have some fun while staging. 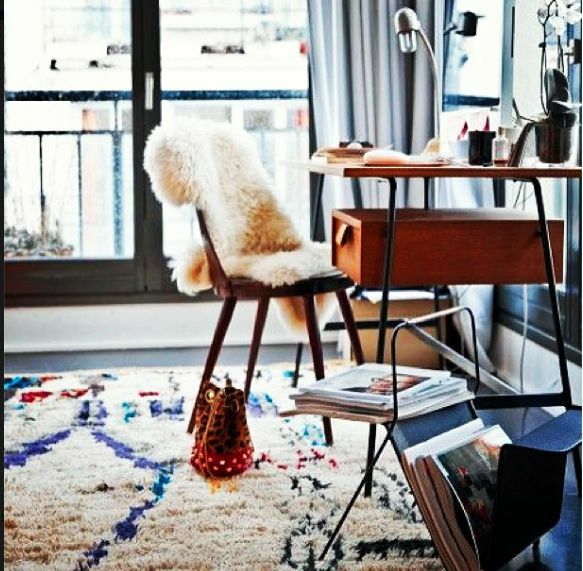 If you are looking for a more luxury/classic rug for a space, try working with a Beni Ourain! 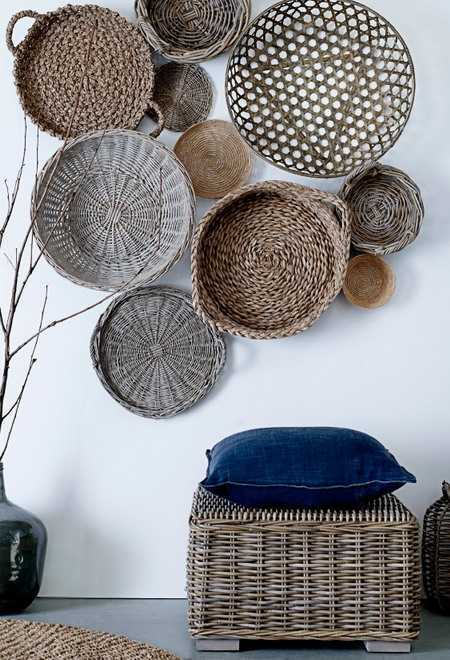 They are full of texture but are neutral enough to fit into any space. This glass window was insane! Just loooove this shot. 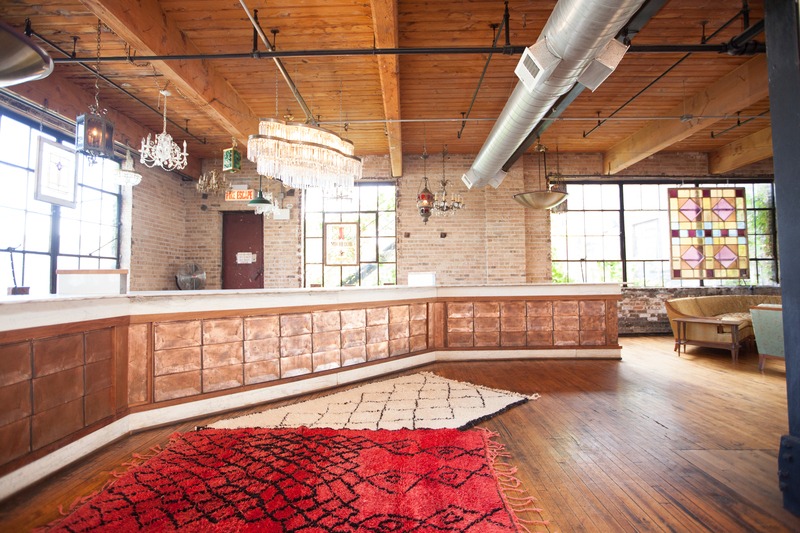 This bar was was beyond incredible, I had to stage our most luxurious rugs next to it. Aren’t they beautiful?! You can’t go wrong with pom-pom blankets!!! They look phenomenal where ever you place them. What’s the deal with floor pillows? We love them!!!! 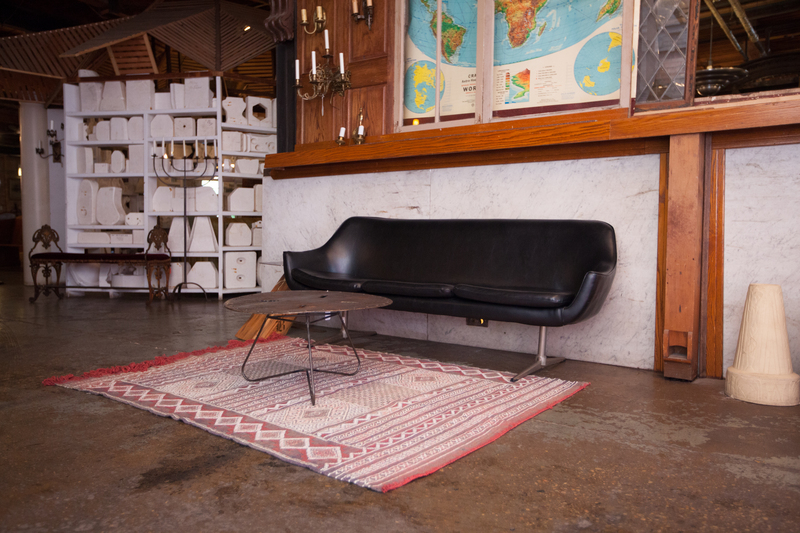 Low floors seating is making a come back! 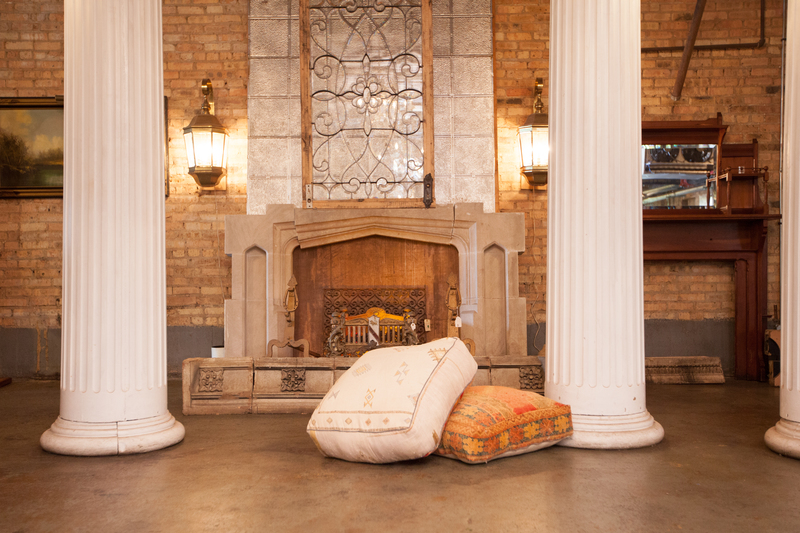 Over the past year or so, I have seen floor pillows and poufs become so popular in the design world. 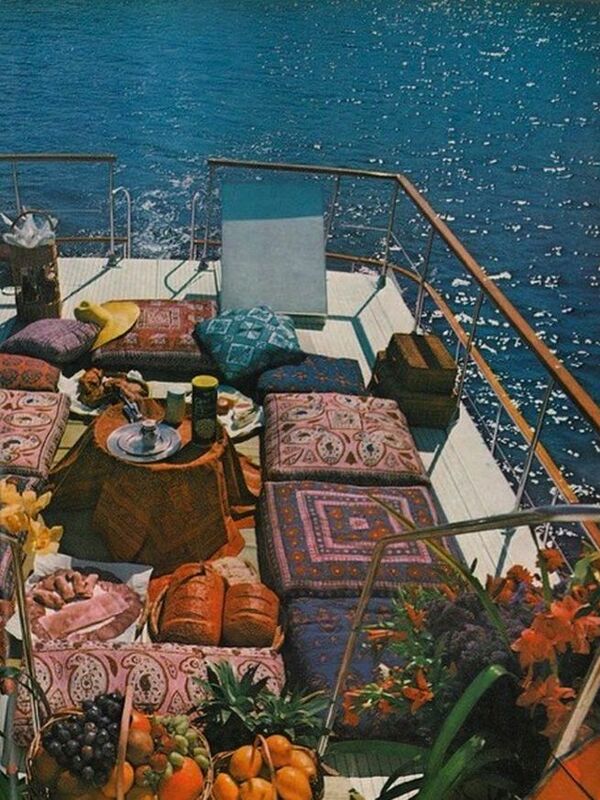 I personally love the idea of having a huge colorful cushion to sit on the floor with, what could be better! Our floor pillows have been selling out like crazy! 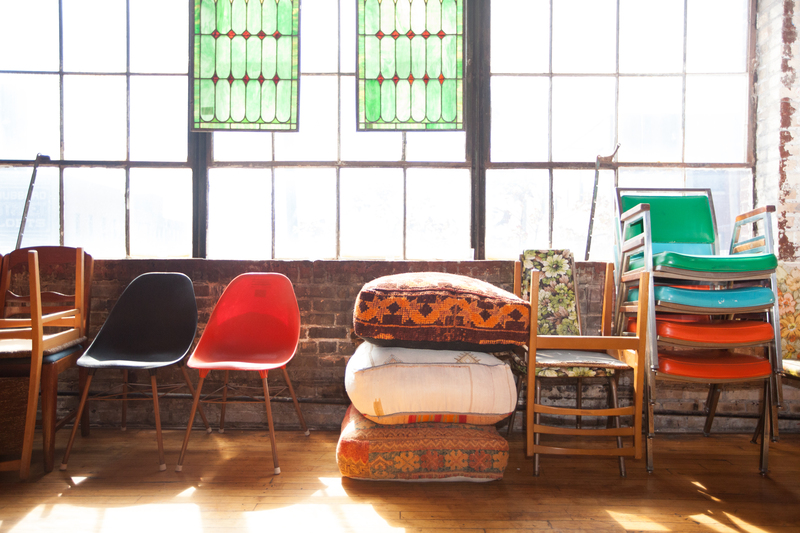 I can’t wait to see how each shopper styles their home with these gorgeous textiles! Here are some ideas if you are looking to purchase one yourself! 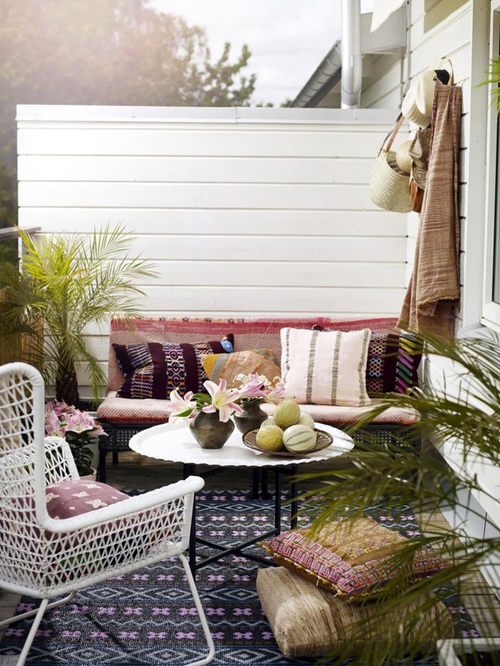 Perfect for an outside space! Glamor shot! They add sooo much color to this modern room! The perfect floor accent! 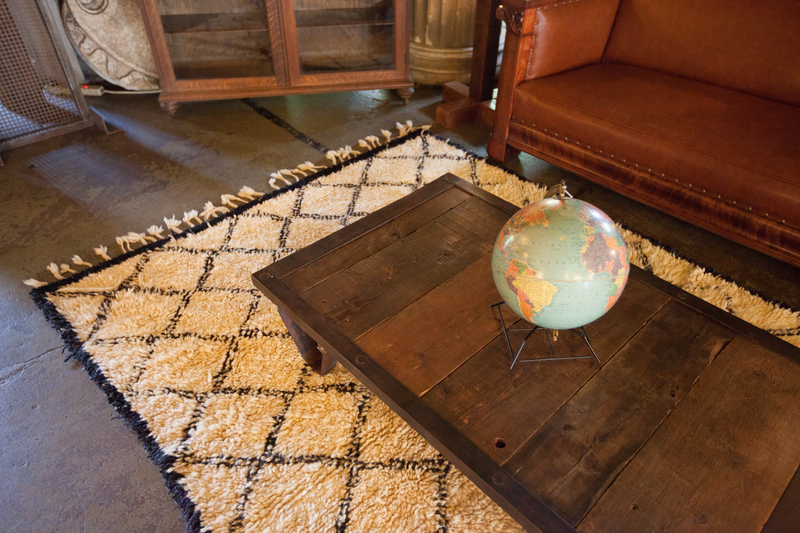 Especially if you have a simple area rug, works as a great color pop! Hope you found a bit of inspiration! Let’s face it, sometimes you just need another opinion when choosing an outfit or rearranging a room in your house. Our husbands, roommates, or siblings just don’t always have the answers we are looking for:) Maven is SO thrilled to launch our personal styling service! Whether you are trying to figure out how to stage our new floor pillow in your living room or putting a new outfit together with one of our killer statement necklaces, LET US HELP YOU ALONG THE WAY!!! 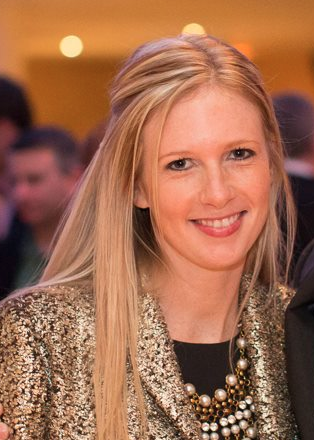 Meet our Styling Maven, Sarah! We wanted you to get to know her a little before you start working with her, so we asked her a few questions! Who is your style icon? My style icons are Kate Middleton and Rachel Zoe. I love Kate’s classic and elegant look and I love Rachel’s boho style. Why do you want to be a stylist for MAVEN? I believe in unique one of a kind pieces and Maven not only offers this but all of the pieces are handmade and from passionate artisans around the world. What is your favorite MAVEN product? My favorite Maven For Her product is the fold over clutch. I love the variety of colors that it comes in. 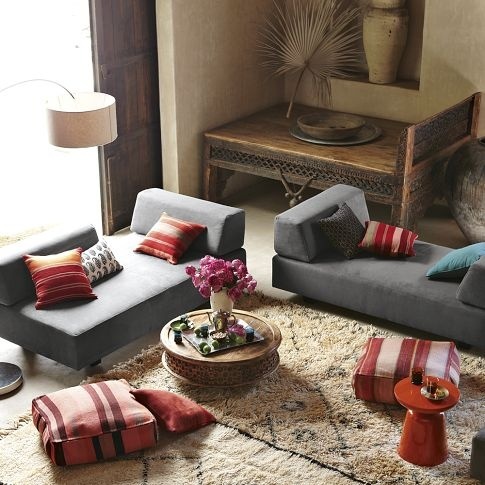 My favorite For the Home products are the luxurious Moroccan wedding blankets. These blankets are absolutely stunning! Do you have a country that influences your design/style the most? I would have to say Paris! I love the pride they put into their clothing and home designs and the flea markets are amazing! So next time you see a product on our site and are wondering how to use it in your house before you purchase it, CONTACT SARAH! Or if you are going to BBQ and are in need of some outfit suggestions to pair with your new zebra flats, CONTACT SARAH! She is happy to answer any styling questions you may have! I recently went to Santa Fe for the International Folk Art Market. Ironically, I have only attended art markets outside of the States. This was my first one to attend that was less than a 4 hours plane ride to get to! I had a wonderful time and got to see work from over 40 other countries. I came home with a ton of new artisan contacts and even better… a few killer artisan finds! I was not on the look out for baskets but when I saw them, I knew they where a must have! These were handmade in India but have a Navajo influence which I am loooving! As promised, I wanted to provide you with a few ways to style these lovelies in your home! 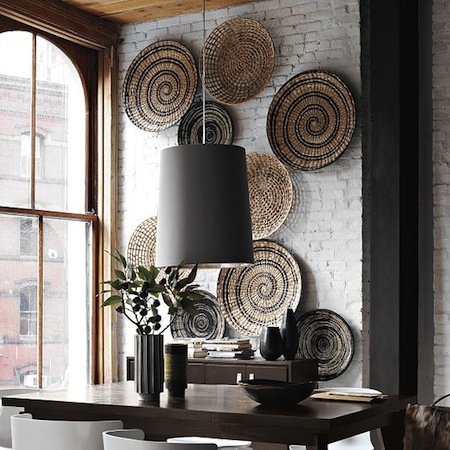 I love how West Elm staged this on a brick wall, pulling out the grey tones. Works perfect in a kitchen! 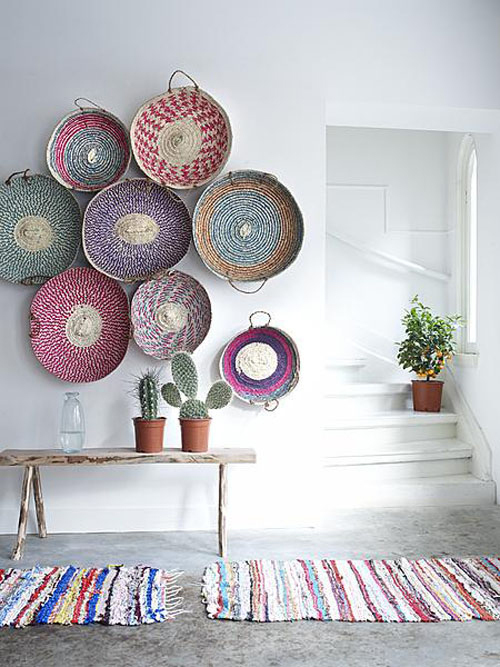 3 vertical baskets on a plain white wall. 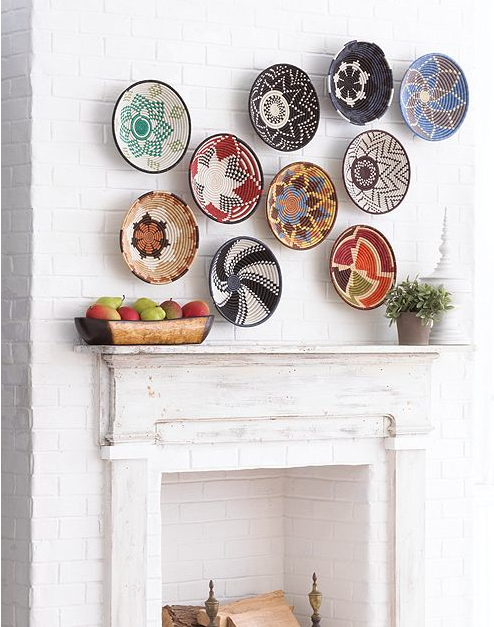 Great conversation piece for an entry way. Lovin’ the different shapes and sizes here. Hope you found something inspiring!